The word ‘aviatrix’ acquired a certain currency during the 1930s when intrepid women pilots, such as Amy Johnson, were making the news by breaking records and undertaking long solo flights. Alison Hill’s Sisters in Spitfires, published this month by Indigo Dreams Press, is a poetic tribute to the many aviatrices of the wartime Air Transport Auxiliary. 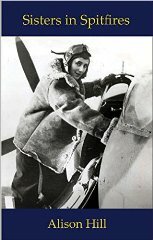 (Interestingly, this book of aviation-related poems comes quite close on the heels of two other recent collections: Jo Colley’s Bones of Birds (Smokestack 2014), which deals with the New Zealand airwoman Jean Batten and the exploits of Soviet women fighter pilots; and Fred & Blossom by Michael Bartholomew-Biggs (Shoestring, 2013), which tells the romantic story of a husband-and-wife team of aircraft designers.) The women pilots who flew with the Air Transport Auxiliary during World War Two were given the job of ferrying new aircraft from factories to the squadrons. Initially they were allowed to fly only smaller aeroplanes; but eventually some of them were cleared to handle four-engined bombers – much to the surprise of the ground staff at their destination aerodromes who would often ask them where the real pilot was! The collection gets off to a good start with a poem about a schoolgirl prank of smuggling fruit into a boarding school which hints at the “tomboy” image (some of) the ATA women acquired – and perhaps even cultivated : Pauline was mortified to feel her elastic give // half-turning to spot a steady trail of oranges. ‘A Touch of Silk’ also adopts a cleverly oblique approach by conflating the packing of a parachute (signifying the real risks of flying) with the packing of an evening gown (suggesting the, often fleeting, glamour of a pilot’s job). dashing about in a plane. Hill devotes a section to press coverage and public perception of the ATA from which we learn that the papers could be as crass in 1936 as they are today. The Daily Express posed the headline question Do Air Women lack Charm? Society girl Jill Wyndham offered to show him just how charming she could be. The Evening News in 1941 was, if anything, even less tactful observing that ATA women pilots might easily be men. Pictures were evidently kinder than words; and when Maureen Dunlop appeared on the cover of Picture Post she helped to establish a more glamorous image. sit on parachutes they hadn’t practised using. familiar spires to mark landing strips. Whoever was dead or missing, we had to let them go. that patch of sky ahead. The book’s final section deals with the end of hostilities. ‘Brooklands Swing’ beautifully catches the atmosphere of a Victory Ball, using language that seems to have broken free of clipped war-time understatement. I’d wiped the blackboard, filled in any gaps. It was good for morale; it had to be done. Sisters in Spitfires draws on a substantial amount of historical research. (The same is true of Bones of Birds and Fred & Blossom – and also of Convoy by Caroline Davies (Cinnamon, 2013) and Finns & Amazons by Nancy Mattson (Arrowhead, 2012)). When faced with a considerable body of archive material, a poet needs discernment to pick out those parts which have most poetic potential. Alison Hill, by and large, has made good choices; although it is her character- rather than her event-driven poems which seem to me to be most successful. Those which offer some psychological insight are usually more satisfying than ones which simply re-tell a dramatic or amusing incident. The best of the story-telling pieces are probably found in the prose-poem sequence ‘Diana’s Nine Lives’. For me, the first and last sections of the book are poetically the strongest, perhaps because these have less to do with the technicalities of flying and leave more room for exploring emotional responses. But the entire book is engaging and does ample justice to a piece of history that deserves to be better known. Thomas Ovans is NOT (as some google searches might suggest) a Nashville-based, Boston-raised street rocker. Instead he lives in London and has a background in technical writing and editing. He is also a regular reviewer for London Grip. His own poems have appeared most recently on Ink Sweat & Tears and The Stare’s Nest.